The end is here! I have combined the last two days of the giveaway because I think these two are just too awesome to post for only 24 hours. So this giveaway will end on December 31st at midnight! Are you as excited now as I am?!? Enter below! I wasn't able to partake of the recent Pixiedust BOGO, so I'd love those! I thought these were the last prizes, great giveaway! I would love to see a purse tomorrow. Thanks for the opportunity. I would love to see anything! All your prizes are incredible! I must be confused because I though these were the last prizes! (Maybe too much egg nog! LOL) Anyways, I'd be happy with anything-maybe so awesome holo nail polish or glitter eye shadow for NYE! Would love to see a MK wallet. The Zoya polishes are gorgeous!!! Thanks for the month of giveaways!! This was the last giveaway. Thanks for all the goodies you gave away. Fingers crossed I'll win. I think this is the last of your 31 days of giveaways. But if you were to do another, I'd love for it to be butter LONDON polishes! Soo freaking cool! Can't wait to see who wins! Any product related to nails would be perfect. They're all amazing, love the pinks and reds! 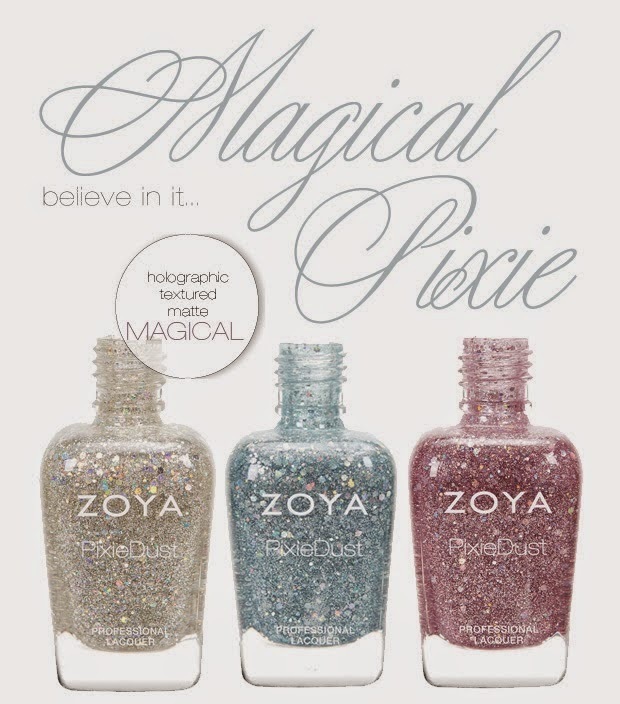 I like most of them, but my fav so far is Lux Magical Pixie Dust! The gold shade to the far left! My favorite pixiedust is Carter. The blue pixie dust is my favorite, they are all so gorgeous! ALONA Y. Thank you for a great giveaway! They are all fab, but I love the Blue especially. I like The Zoya polishes. Godiva is my favourite pixie dust!! Thanks for this giveaway!! My favourite Pixie dust is Nyx! I like all the Pixie dust polishes. They are gorgeous. I love red so I would pick Chyna or Oswin as my favs, from the set you are giving swag I think Vega is my fav! Thank You So Much for Your Generosity for this Awesome Zoya Pixie Giveaway! I Am a Huge Fan of Anything Colorful or Sparkly and I Have Always Been That Way! Something about Vivid Neons, Pretty Pastels, or Shimmer & Glitter Makes Me So Happy; I Mean Who Doesn't Love Glitter? I Have Not Tried These Nail Polishes as of Yet and I am Sad to Hear that They are Going to Quit Making Them? That Makes Me Want to Try Them Even More! I am Not Currently Working but I Used to be a Make Up Artist & Esthetician but I Was Always Drawn to Anything Nail Related! I Used to Watch All the Nail Techs Create All These Nail Works of Art and I Was So Envious b/c I Would Love to be Able to Do All of That! I Can Do a Pretty Good Basic Mani but That's About it but That Doesn't Stop Me From Loving Nail Art & My Nail Polish Obsession! I Think if I Could Only Have One of these Nail Polishes than I Would Probably Pick the Pretty Silver One, Which Really Shocks Me b/c I Love Pink! I Think the Silver One Could be Worn Over Just About Any Color and it Would Match Anything You Wear, You Know What I Mean? Anyways, Thanks Again for this Chance, I am Really Grateful & Truly Appreciative! I Hope You and Your Family Have a Safe & Happy New Years! Take Care! I love all of the Pixies, but Godiva has to be my favorite! Lux is so pretty! Thanks for having this giveaway!